VJ Sniper - MT4 Buy / Sell Indicator: This Indicator is as simple as Buy in Up Trend & Sell in Down Trend. There are 2 Support / Resistance lines for choosing the best Entries. 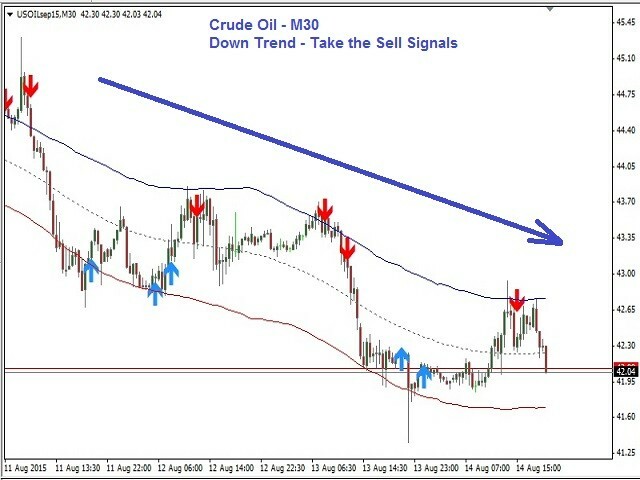 Background: Any in-built indicator of MT4 does not work as stand alone such as Stochastic, CCI or DeMarker etc. But combination of them with trend projection work & give the best results for Trading entries. So this Indicator is blended to give the best results while reducing the false signals as best as possible. There is no holy grail or 100% guaranteed entry indicator, it is all about high probability. 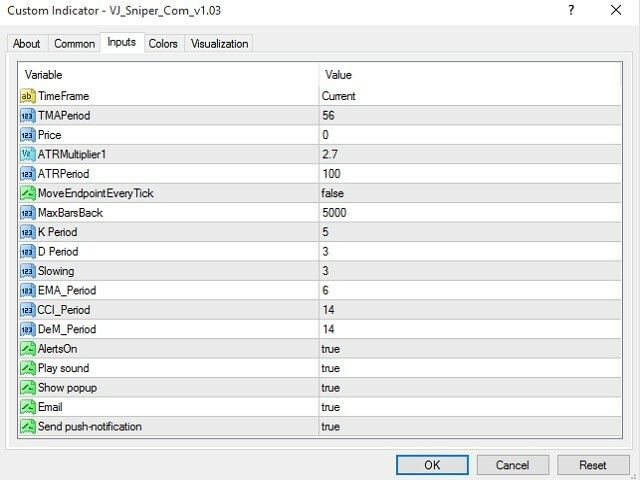 So "VJ Sniper" brings highly probable trading signals, following the rules for profitable trading. It works on any Instrument & Any Time Frame except M1. Entry at the beginning of the Candle, it is based on the close of the previous candle which means that you can take the trade as soon as you see the signal & do not wait for closing the candle. Signal does not repaint on low volatile instruments. It may rarely repaint on high volatile Instruments. No Blinking of the arrows, clean signal at once. Signal is early, not like other indicators giving the signal after going far away either side. Trend is clearly visible through Trend Bands. VJ Sniper contains 3 trend bands & Signal arrows. 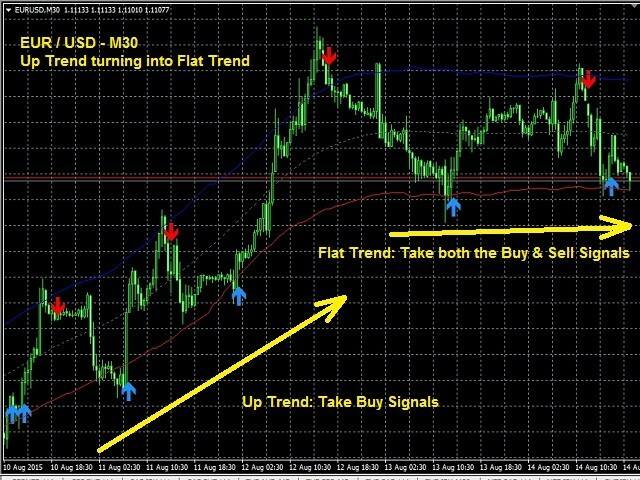 Trend Bands Show the Trend "Up / Down" & the Arrows show Buy or Sell. In an Up Trend, when a Buy signal (Arrow Up) is popped up, take the Buy trade. In a Down Trend, when a Sell signal (Arrow down) is popped up, take the Sell trade. Consider TP & SL at Support / Resistance levels OR at the level of Curves. Example: If you take a Buy, your probable TP based on the Trend bands is the Middle curve & upper curve. 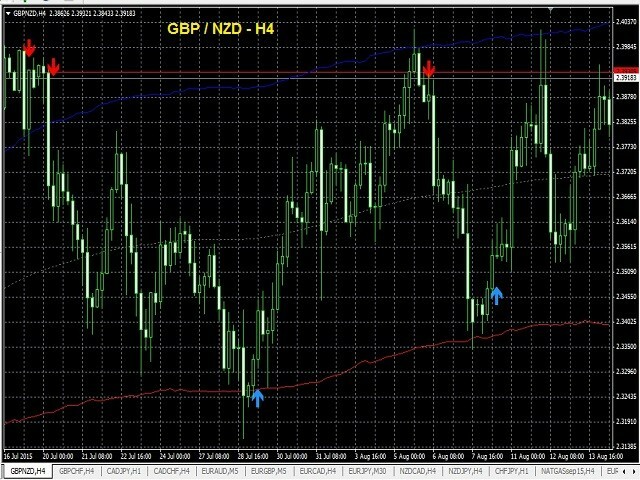 Best Time Frames : M30 / H1 / H4. But it works on any TF except M1. For the first time installation, it requires data to produce the signal, keep switching the Time frames back & forth till you see the clear signals. This indicator works best on low volatile instruments (best for Forex). If you combine Price Action & Candle stick strategy with this, that can become your own Holy Grail system. Awesome indicator!!! Probably the most reliable I've ever bought. It helps to determine Supporte and Resistance zones. Also if you take your time to analize you will also learn about when you can expect "half the ride" between upper and lower and when you can expect the whole channel width...I use it with 5minute chart with the 30minute on the back mirror and 34s low and high and 9 at close MA trends within the channel. 9MA shifting close to the upper or lower line is also a good confirmation. The signal has no use but drift!!!!!!!!!!! Hi trader, it is my first purchased indicator. It is simple and clear and easy to trade. I use the Indi in the 30 min chart with the 20 and 200 gd as well as candle formations for trend determination and entry. Congratulations on the indicator. This indicator is 10 times better than bollinger bands. It gives you more precision and you can determine support and resistance levels way better. For the price this indicator costs it's almost free. You couldn't ask more from an indicator. This is the second paid indicator I bought, and am very pleased with the purchase. Vijay is a very nice person. 5 stars anytime! The Bands repaint and many arrows apears magicaly on past. Very nice indicator. Always trade with trend as Vijay mentioned and you will win more than you loose. I use 200 moving average to always trade with trend. Thank You Vijay.. High Profit and minimum risk Product. sell when very high and buy when very low. Don't follow an arrow sign frequently (arrow set to off). entry with pending order buy and sell between price where bounce several time at SR. trade safe. don't gambling. 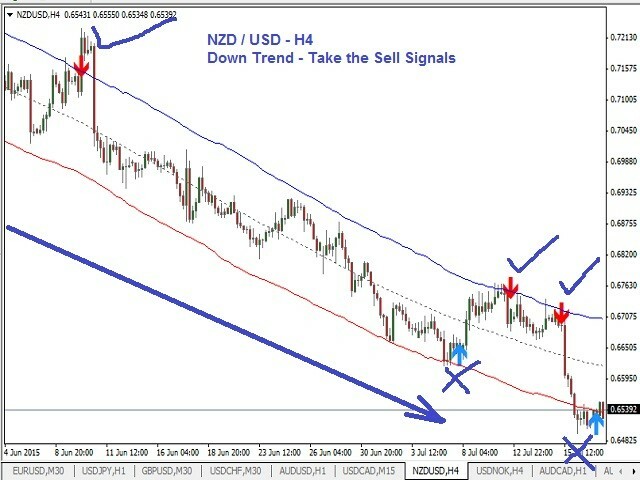 Combine with some zigzag line in VJ Sniper Bend and you will see the pattern form, and you will know where the price go. This VJ Sniper is really original trading skill. Other peoples here say it repainting. I don't care. just set an arrow off and trade with MA Line. Please use VJ Pivot, it will help to set TP and SL. Try your self, You wont regret!! I purchased VJ Snipper 4 months ago. So far it is the best indicator that I have ever tested. I use it in a simple system of indicators together with Bollinger Bands, Stochastic, And Currency Strength. Since I started this system I finally have stable income from my trades. VJ Sniper is the main indicator in my system, but no indicator can replace human brain. I still have to think on my own when I trade. When I had a little technical problem, author was very responsive and helpful. Many thanks to author! 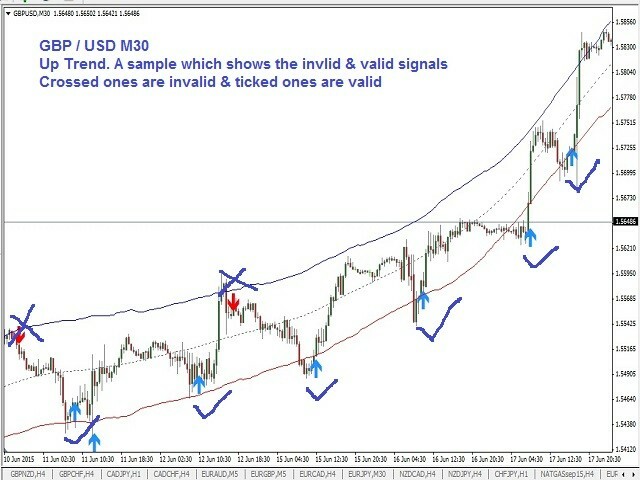 Very practical indicator for trend traders, the bands are quite helpful for filtering entries. I've back tested on many pairs and time-frames and it works the vast majority of time (also need to take into consideration repaint and band angle may change in real time due to subsequent price action), so back-tested results will be better than real life ones. Anyhow, this is a great tool, well worth the price. Well done Vijayaratna! This is one of the best indicator. I don't use signal solely as my entry, I combine it with price action. Indicator really helps showing the trend. Place TP and SL based on Support and Resistant. Works great!! Excellent indicator. Thanks to the author. This is an execellent indicator. From live trading results, it does give a big help to get more successful trades. Good job Vijay! A great tool to add to your trading arsenal.. Vijay has been amazingly supportive and given me a lot of help with the proper way to use the indicator, and taught me so much along the way. A true gentleman, one of the few people in trading who really want to help others to succeed in trading as he has. If it is used as instructed by Vijay this is an amazing indicator. Just ask for help with how to use it properly and I'm sure he will help you. But don't expect it to be the be all and end all, it must be used as instructed, in conjunction with other technical analysis methods as described by Vijay. I can attest that used properly this indicator works very well to assist you in making profits, live. Hi, i have been using this indicator since a while and it is really great. Till now 90% of all the trades were successful. It is very important to follow the instructions. The author is absolutely amazing. He helped me with so much stuff in just the last week. I tried so many other indicators and EA's and nothing worked. He sent me instructions, gave me advises and it works for me. Thanks a lot. You are a great guy Vijay Boda. I'm very impressed. I tested almost hundreds of indicators, most of them showing fantastic track records, but in real most indicators produced losses. VJ Sniper seems to be different. I am quite confident that finally I have found a profitable indicator. And of course have to follow the rules. I will update the results in the near future. UPDATE (12 Sep 2015): Well, I have entered 35 trades using this indicator since 26th of August, and 31 trades were successful. That is 89% successful trades. Thanks! as they show the trend and what calls to take. I stick to trade in the direction of the bands and when the price is next to the bands (not midway). Apart from that to increase the odds in my favor i am using it in conjunction with S/R, trendlines and generic price action. Definitely value for money and quite happy i did choose this one up. I was looking for a trend indicator indicator which made me to stop and back test "VJ sniper". Its my third day ,I did my testing on demo with the rules mentioned. I am satisfied with the test results which gave me 75-80% positive trades when used with trend lines. I found Good in this indicator, that I can load on all my favorite instruments on the background. If any trend change happens on any instrument, alert pops up with probability buy / sell trend notification on my system as well on my mobile. I recommend you all to test with mentioned rules. Does not redraw so I rate this an excellent indicator. Not 100% accurate but what is? I would say it is 90% accurate which would help anyone's trading. It is a must have! Added the editable parameters table for all parameters. Do not modify them until and unless you have extensive experience.